Trump needs a coherent U.S. policy toward ASEAN. Given the increasingly important role of Southeast Asia/ASEAN on the Indo-Pacific geo-strategic chessboard, the United States under the Obama administration established an enduring framework for U.S. engagement in the region. Economically, Washington took the leading role in creating a 21st century Trans-Pacific Partnership (TPP), which was to include four ASEAN economies. Diplomatically, the U.S. signed the Treaty of Amity and Cooperation in 2009, and appointed a resident American ambassador to ASEAN (the first non-ASEAN nation to do so). Meanwhile, American dignities like the secretaries of State and Defense and other senior officials participated in all regional meetings, familiarizing themselves with ASEAN’s free-flowing approach. Obama himself visited Southeast Asia nine times during his eight-year presidency for APEC and EAS summit meetings. In February 2016, during his last days in office, he hosted the first stand-alone US-ASEAN summit at Sunnylands in Rancho Mirage, California, which set forth broad principles guiding U.S.-ASEAN relations for the following years. On the South China Sea, the primary security concern to the Southeast Asia, the Obama administration pursued an eventual whole-of-government approach. 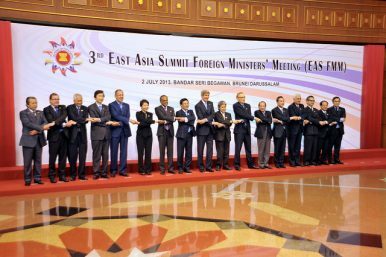 The administration engaged in ASEAN-led fora to make sure that the South China Sea issue would receive rapt attention. It respected and supported ASEAN centrality, and encourage ASEAN and China to swiftly conclude a binding Code of Conduct that regulates good behavior at sea. The U.S. also formed new bilateral partnerships with Vietnam, Malaysia, and Indonesia, and consolidated a longstanding alliance with the Philippines through the Enhanced Defense Cooperation Agreement and an agreement for five new rotational bases adjacent to the South China Sea. It tirelessly supported the Philippines in its arbitration case against China at the Hague, in which the Philippines earned an overwhelming win. The Pentagon performed some modest freedom of navitation operations (FONOPs) to challenge the Chinese island reclamation and militarization campaign, and started to implement the Maritime Security Initiative that encourages the recipients to align themselves with a common maritime awareness network. As a result, there has seen a positive change in region’s perspective on the U.S. Most countries in the region, except China, welcomed the American presence as a guardian of rules-based and instutitions-based order. They felt like the U.S. had not stood back, and that it would not compromise with China at the expense of ASEAN partners. The Trump administration’s initial moves, however, raise some doubts. On his first working day in the White House, President Trump signed an order to withdraw the U.S. from TPP, causing alarm that he might be more attentive to bilateral than multilateral affairs. On March 18, Secretary of State Rex Tillerson visited China, stated at a press conference with Chinese Foreign Minister Wang Yi that the U.S.-China relationship has been guided by an understanding of “non-conflict,” “non-confrontation,” “mutual respect,” and “win-win cooperation.” Wise observers quickly noted with skepticism that the choice of words could reflect Washington’s accommodation of Beijing’s quest for primacy in Asia. If so, that would be a major disaster for U.S.-ASEAN relations writ large. To dispel the doubts, the Trump administration needs to quickly introduce a clear policy toward ASEAN. Here are some key recommendations. First, the Trump administration needs to show that it is fully behind a strong ASEAN. Individually, the voices of Southeast Asian countries count for relatively little internationally. Collectively, however, as an integrated group of more than 600 million people, ASEAN can make itself an important player in regional economic and strategic affairs. As a result, a strong ASEAN will help the U.S. balance the power of rising China. Second, the administration needs to facilitate strong engagement in regional fora. Because of the importance of the symbolism associated with top representation at meetings, Trump needs to attend APEC and EAS summits to be held this year in Vietnam and the Philippines respectively. Also, the secretaries of State and Defense and other senior officials should participate in key meetings, particularly ARF and ADMM+. This is crucial because it would help the Trump administration influence the agenda of such multilateral mechanisms in American national interests on the one hand, while enabling the U.S. to exercise its leadership role in tandem with the central role of ASEAN on the other. Third, the U.S. needs to foster economic cooperation with ASEAN, in that Washington will enjoy great benefits. Taken together, the 10-nation group makes up one of the world’s largest and most promising economies of recent years, with a single market of 625 million people and a combined gross domestic product of $2.5 trillion – the third largest economy in Asia following China and Japan. ASEAN collectively ranks the fourth largest goods export market for the U.S. after Canada, Mexico and China, but it will grow larger as the middle class in Southeast Asia is expanding and is expected to reach 400 million people by 2020. Hence, further trade liberalization with ASEAN will help the U.S. export more manufactured goods and create more jobs for Americans. Fourth, Washington has to transform its ally-and-partner system in Southeast Asia to fit new circumstances. The Philippines under Duterte does not seem intent on severing ties with the U.S., but rather on balancing its foreign policy with a greater focus on improving relations with China for trade and investment returns. Similarly, Thailand since the military coup in 2014 has never fully followed the U.S. geopolitical plans, but has tilted toward China for economic gain. Indonesia under Jokowi has focused more on its domestic agenda, while Malaysia appears to be bandwagoning with China. In contrast, Vietnam is emerging as one of America’s most credible partners, better serving as new strategic link for U.S. engagement in the region. Last but not least, Trump administration needs to continue the ongoing whole-of-government approach to the South China Sea, but use diplomatic, economic and military means more precisely and more powerfully. For instance, public statements must be direct and strong; FONOPs must be carried out with great fanfare. If China issues statements or engages in unprofessional behavior, U.S. forces must react without delay. In addition, while strongly calling on ASEAN and China to finalize a binding Code of Conduct, Washington can also impose sanctions on Chinese companies that engage in “illegitimate activities” in the South China Sea. Those acts, among others, will demonstrate American strength. In conclusion, a coherent U.S. policy toward ASEAN is needed. President Obama set a good foundation for U.S. engagement with ASEAN. The Trump administration needs to build on that and develop it. That is a useful way to make common cause with ASEAN. Thuc D. Pham is a research fellow at the Diplomatic Academy of Vietnam. The opinions expressed in the article are those of the author and do not necessarily represent the views of institutions to which the author is attached. Loving Vietnam, Criticizing Cambodia: Trump’s Double Standard in Southeast Asia.What Does Southeast Asia Think About the Trump Presidency?Could Vietnam Have Avoided the 1979 War With China?Southeast Asia’s Battle Against DisinformationCan ASEAN Play a Greater Role in the Mekong Subregion?